An exceptional documentary fiction in the footsteps of the most famous equation in the world and renowned scientists who contributed to the hatch. A fascinating documentary fiction to revive the epic of one of the greatest discoveries of all time, through a striking portrait gallery through the centuries and countries: Michael Faraday Humphry Davy Antoine Lavoisier and Emilie du Chatelet. Documentary Fiction Gary Johnstone with Aidan McArdle, Shirley Hender Son, Julian Rhind-Tutt, Sam West and Helene De Fougerolles. 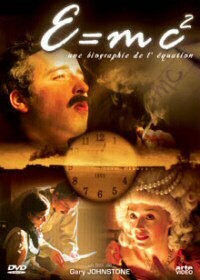 To mark the centenary of the discovery of 1905 in the equation E = MC2 this exceptional docudrama based on the bestseller by David Bodanis tells the incredible story of five major scientists who provided the crucial parts a gigantic puzzle finally solved by the sixth and largest of them: Albert Einstein. Covering 250 years of history, "E = MC2" brings to life the lives of those who hide behind the most important scientific discovery of all time and who paved the way for Einstein: Michael Faraday, Antoine Lavoisier, Humphry Davy and Emilie du Châtelet. How Einstein is not it crazy? Etienne Klein, a physicist at the Commissariat à l'Energie Atomique, Paris - Another legacy of Einstein: astrophysics and cosmology, by Jean-Pierre Luminet, an astrophysicist at the Paris Observatory - Emilie du Chatelet, a woman science, by Elisabeth Badinter, a philosopher, of Emilie du Châtelet biography - Chinese portrait of Einstein, by Françoise Balibar, science historian, biographer of Albert Einstein.